Taylor’s high-quality products, especially for soft serve treats and frozen drinks, allow anyone to become a "gourmet ice cream chef." You can grill in 1/3 of the time of conventional grills ! Menu items are served FAST with Taylor QS Grill Systems. Flavor Burst offers more than 40 different premium flavors from which to choose. Follett equipment provides labor-savings, sanitation and safety benefits to operators worldwide. Take vanilla soft serve, or soft frozen yogurt and turn it into one of 24 different flavors on a cone by cone basis! Global foodservice solutions: including frying, combi cooking, holding, displaying, and chilling equipment. Leading suppliers of innovative foodservice. Soft serve ice cream is one of the most profitable and easily produced items on your menu. The product is manufactured in and dispensed right from the freezer. 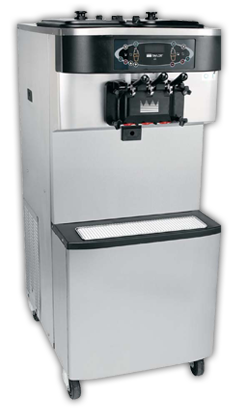 Our gravity fed freezers come in two flavor twist or single head dispensers. We have floor or counter top models in a wide range of production capacities. Taylor is the food service industry leader. They have manufactured custom-built, easy to operate equipment for creating anything from sundaes and frozen coffees to grilled hamburgers since 1926. Taylor’s high-quality products, especially for soft serve treats and frozen drinks, allow anyone to become a "gourmet ice cream chef." • Our freezers produce the creamiest, most flavorful ice cream in the world! Promotional materials and signage available.